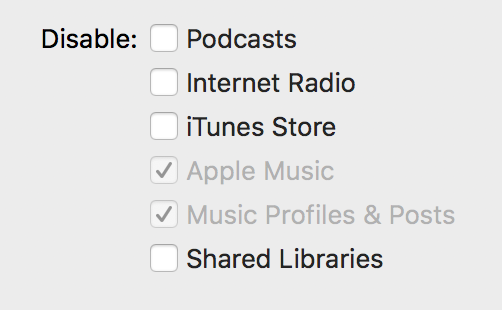 In iTunes' preferences pane for Restrictions, Apple Music is grayed out and checked as disabled. Any idea how to enable this? The lock is not engaged at the bottom. Looks like I had a Device Profile created by my administrator which disabled Apple Music, among other things. Probably you have some custom "Profile" in your Mac try to remove it. check your "Profiles" list (in terminal) sudo profiles list. sudo profiles remove -identifier (identifier from the previous step). Not the answer you're looking for? Browse other questions tagged itunes high-sierra apple-music . DRM Free Music With iTunes Match & Apple Music? How to disable Apple Radio in iTunes and iOS? Why are some tracks in my iTunes grayed out? How to allow explicit content on Apple Music (family sharing)?